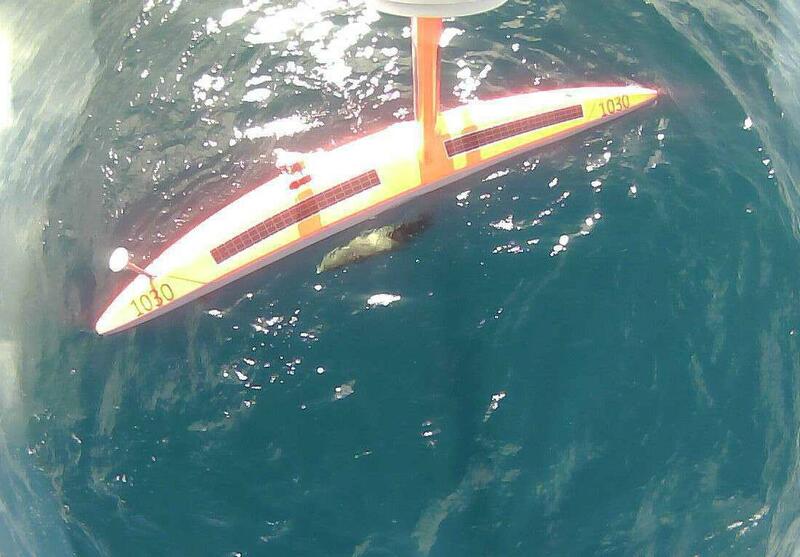 This mission is supported by NOAA GOMO (formerly OOMD), NOAA OMAO, and Saildrone, Inc.
On October 3, 2018, four Saildrones were launched from Keehi Marine Center in Honolulu, HI to begin a six-month research mission in the tropical Pacific Ocean. This mission is part of a series of Saildrone missions to the tropical Pacific, focusing on how this new technology could best be used within the Tropical Pacific Observing System (TPOS) to improve longterm weather forecasts. We welcome you to follow our mission updates here on the blog. Tropical sunset captured by a Saildrone. When you try to do things that have never been done before, sometimes those things don’t go as planned. Due to some navigation issues, the Saildrones had to turn back to Hawaii early. When they’re recovered, the drones will be completely checked out to determine what caused the issues. Saildrone engineers will work to come up with solutions that can be applied throughout the Saildrone fleet, improving performance for all of their vehicles. Though this mission has “sailed into the sunset,” we’ll be launching another mission soon! Red lines show the path of the Saildrones around the buoy at 9°N, 140°W. The mooring anchor position is shown by the red marker. The Saildrones have just completed another key milestone in their journey, successfully sailing around the TAO mooring at 9°N, 140°W. The buoy at 9°N is the northernmost of a string of moorings along 140°W. These moorings are part of the TAO/TRITON array, which consists of approximately 70 moorings in the Tropical Pacific Ocean. The purpose of the array is to measure oceanographic and meteorological conditions, and return data to shore for use in forecasts and models. It is a major component of the El Niño-Southern Oscillation (ENSO) Observing System. As noted in earlier posts, studying ENSO is one of the goals of this mission. The TAO/TRITON array is made up of about 70 moorings throughout the Tropical Pacific Ocean. The Saildrones navigated a box around the mooring site at 9°N, 140°W for two purposes. First, this serves as a mid-mission check that all instruments are operational. The instruments on the buoy serve as references to check the Saildrone measurements against. Secondly, this is a demonstration of the Saildrone's ability to be skillfully controlled. In order to be useful in scientific studies, these unmanned vehicles must be able to go where researchers need them. This can be tricky if winds and currents don't cooperate, as we learned in the previous post. One of the drones did have a little trouble sailing around the box. Watch the time-lapse video below to see how long it takes the drone that comes in from the bottom to make its way around. This is an older version of the Saildrone, which means it has a smaller wing, and doesn't make as much use of the available wind. The other two boats sailed the box without trouble, and the slow boat did eventually make it around. The drones completed their boxes, and are continuing south. They will pass by two more TAO moorings on their way to the main study area along the Equator. Are they supposed to be doing that? 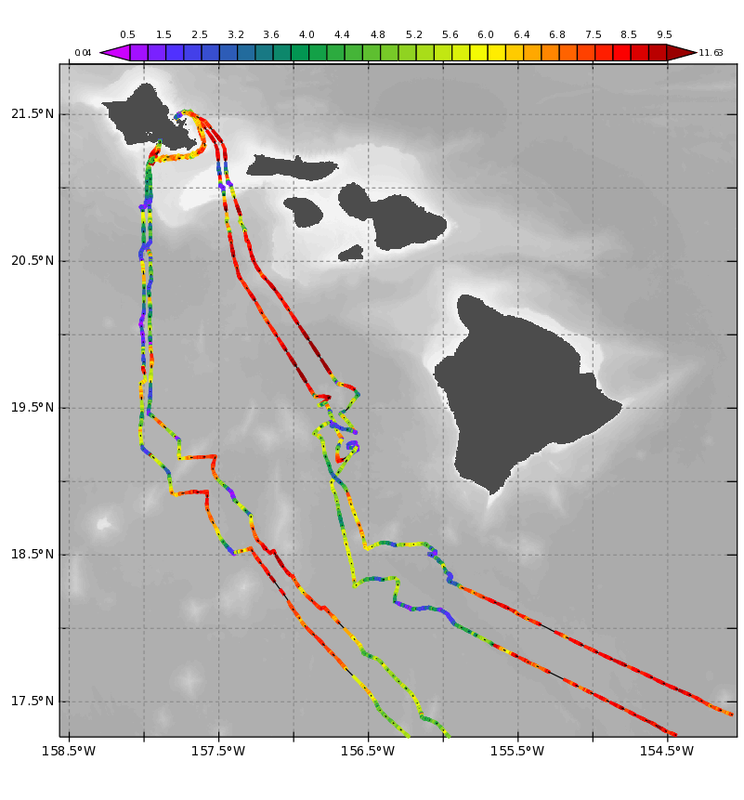 Saildrone track lines, colored by wind speed in m/s, show how the vehicles had to work a little harder to get through the shadow of Hawaii's Big Island. As the Saildrones made their way past “The Big Island” of Hawaii, they stopped going in a straight line. This was not part of the plan. It was, in fact, a force of nature. The Hawaiian Islands stick up out of the ocean, and block the flow of the wind. This creates a shadow area of calmer winds on what is called the “leeward” side of the island. For a vehicle propelled by wind, like the Saildrone, this can be a problem. This forecast model from Windy.com shows how the winds move around the Hawaiian Islands, and can create a calm shadow. Also acting against the Saildrones, the ocean currents around the islands often get swirly, as the islands and wind patterns affect the ocean flow. Patches of water moving in circles, or eddies, move through the area. When the Saildrones don’t have enough wind power to propel them forward, they can get pushed around by the currents. Surface ocean currents modeled by Windy.com often flow in circular eddies around the islands. Two of the four Saildrones on this mission had a little trouble getting past the west side of Hawaii. The wind was calm, and the drones struggled against the currents. They even went backwards at times. Fortunately, a bigger wing (or sail) was installed on the boats just for this mission. This allowed them to harness more wind energy, and get back on course. Once they passed the island, they were right back on track. The other two drones were farther away from the island, so its wind shadow had less effect on them. Their course got a little squiggly, but they sailed through. On to the next challenge! 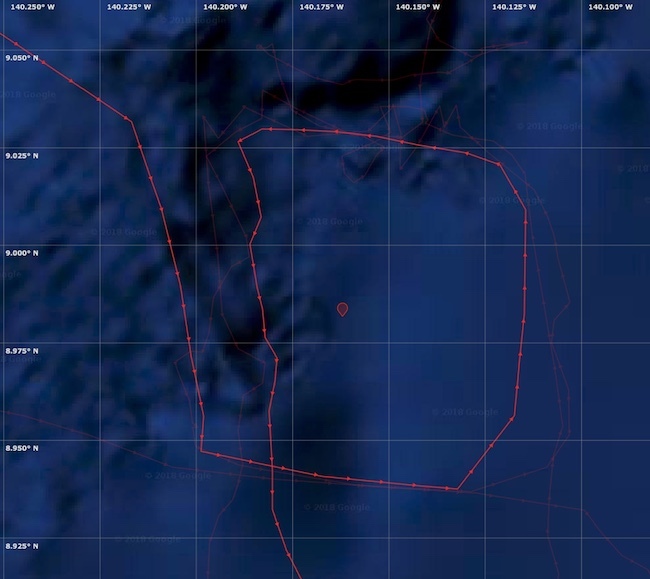 Saildrones navigated boxes (red track lines) around a buoy on the east side of Oahu to validate measurements before starting the science mission. One of the greatest strengths of the Saildrone vehicles is their adaptability. And they had to use that strength right out of the gate for this mission. 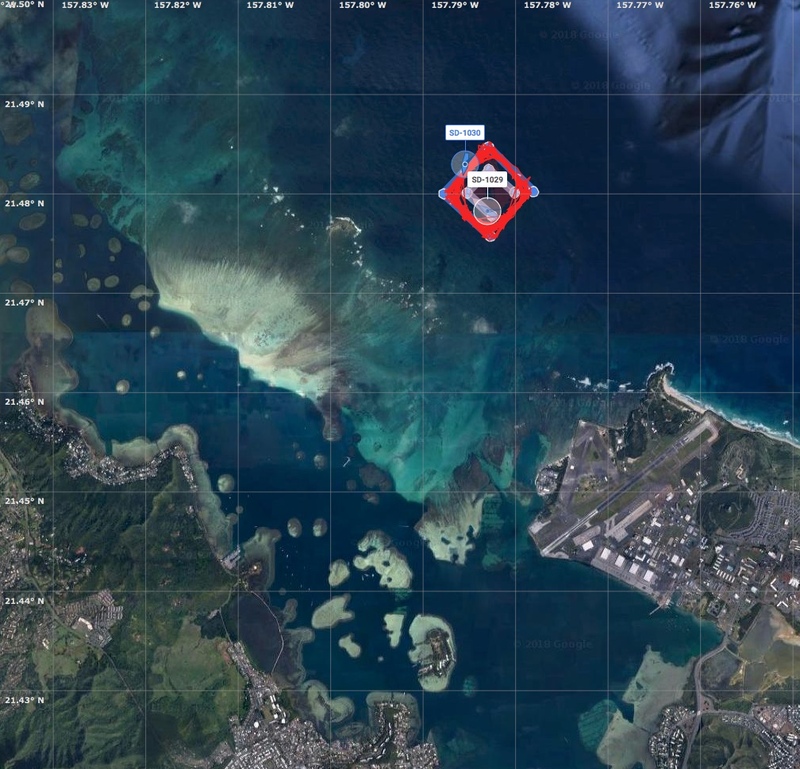 After the launch last Thursday, the Saildrones were scheduled to do some initial testing just offshore of Hawaii. There turned out to be too much commercial and recreational boater traffic in the planned work area. So, plans changed. The Saildrone pilot redirected the drones to a new area, and PMEL scientists adapted their testing plans. The major goals of the tests were still successfully accomplished, just in a different location. These pre-mission tests included performing a series of checks for the Acoustic Doppler Current Profiler (ADCP). The ADCP measures the currents in the surface ocean, to a depth of about 80m (260ft.). Measuring currents from a platform that is moving through the water is tricky business, and these initial tests help to ensure the measurements are being made correctly. The Saildrones also visited a PMEL carbon buoy on the east side of Oahu, sailing boxes around the buoy for hours (image above). Measurements made by the Saildrone instruments during this visit were compared to the instruments on the buoy. Particularly, the systems that measure carbon dioxide levels in the air and water were validated. This is one more way to check that all Saildrone systems are functioning properly before heading out on the science mission. The comparisons all looked great, and the Saildrones are now headed to the tropics! A dolphin keeping one of the Saildrones company in Kaneohe Bay. Look what the cameras on one of the Saildrones just captured! Looks like a dolphin is swimming along next to one of the drones as it's collecting data in Kaneohe Bay. Hello students in Ms. Keene's Florida classroom! One of your classmates called me up and told me that she wanted to share the information about our Saildrone mission in her class presentation today. This page used to be just a placeholder, showing that the drones would launch on October 3rd, which would be perfect timing for her talk. But, I'm sorry to say, the launch is happening in Hawaii, and with the time difference, your class will be over before the big event happens. Later today, four Saildrones will be launched from Keehi Marine Center in Honolulu, HI to begin a six-month research mission in the tropical Pacific Ocean. The Saildrone is an unmanned science vehicle that is propelled only by wind. It also uses solar energy to power scientific instruments. The instruments onboard measure things like air and water temperatures, winds, light and heat from the sun, as well as the seawater salinity, and the speed and direction of the ocean currents. There is also an instrument package that will measure the concentrations of carbon dioxide in the air and the ocean. Measuring these parameters helps scientists to learn more about how they each play a part in the Earth's climate and weather patterns. This mission is the second in a series of three planned Saildrone missions to the tropical Pacific to study the El Niño-Southern Oscillation (ENSO) cycle. (Read that ENSO article I linked. You'll like it!) ENSO is one of the most influential climate phenomena on Earth, and there is still a lot to be learned about how it works. 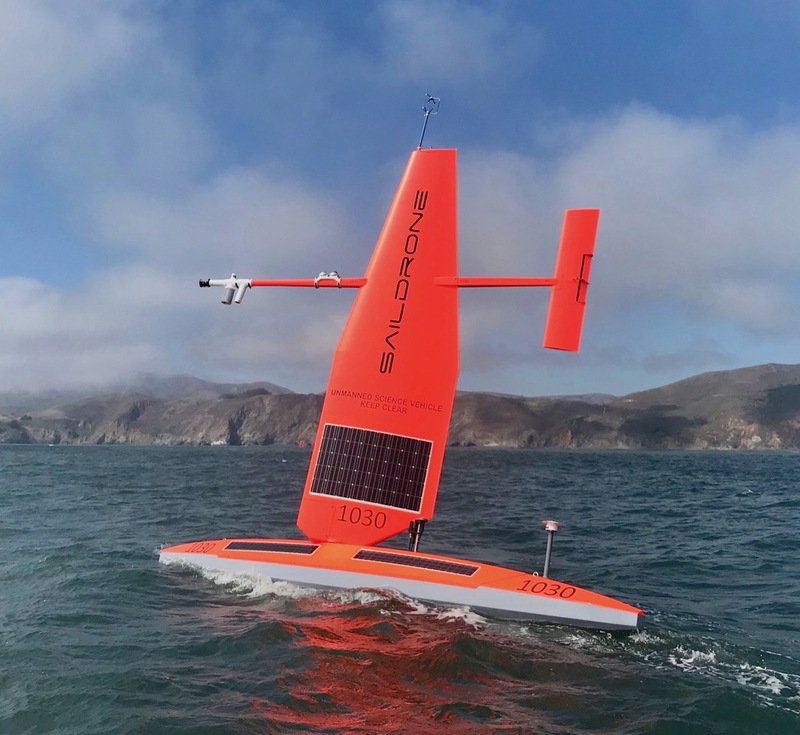 On this mission, the Saildrones may even capture the start of an "El Niño" phase of ENSO, when the surface ocean temperatures become warmer than average. The goal is to better understand interactions between the ocean and atmosphere, and improve long-term forecasts. After a successful first mission in 2017, this mission will focus on the ability of the Saildrone to make observations along the equator. The exact course of the drones will be decided by scientists during the mission, depending on conditions and events observed at the time. The vehicles can be remotely controlled while they're underway, and can be programed to sail a route autonomously. If this mission goes well, the Saildrone platform may be considered to become a part of the larger Tropical Pacific Observing System (TPOS). There are bound to be surprises, and interesting things learned along the way. Be sure to check back here for updates during the mission. I'm so glad you're here to learn about this project! I think this presentation deserves an A+. This blog page is maintained by Jennifer Keene.